This game is very old, nobody knows how old. Some carvings from ancient Egypt show Nine Men Morris boards. The family of "3 in a row" games is big, our game is just one of them (penultimate in the illustration). The game of Nine Mens Morris or Mill is played on a board consisting of three concentric squares connected by lines from the middle of each of the inner square’s sides to the middle of the corresponding outer square’s side. Also, 9 black pieces and 9 white pieces usually in the form of round counters. Mill — line of three pieces of the same color in a row. To begin with the board is empty. Pieces are played on the corner points and on the points where lines intersect so there are 24 playable points. To begin with, players take turns to play a piece of their own colour on any unoccupied point until all eighteen pieces have been played. After that, play continues alternately but each turn consists of a player moving one piece along a line to an adjacent point. During both of these phases, whenever a player achieves a mill, that player immediately removes from the board one piece belonging to the opponent that does not form part of a mill. If all the opponents pieces form mills then an exception is made and the player is allowed to remove any piece. It is only upon the formation of a mill that a piece is captured but a player will often break a mill by moving a piece out of it and then, in a subsequent turn, play the piece back again, thus forming a new mill and capturing another piece. Captured pieces are never replayed onto the board and remain captured for the remainder of the game. The game is ﬁnished when a player loses either by being reduced to two pieces or by being unable to move. The objective is to reduce the number of opponent’s pieces to less than three or to render the opponent unable to play. Sometimes a “wild” rule is played for when a player is reduced to only three pieces. In this case, any player with only three pieces remaining is allowed to move from any point to any other point on the board regardless of lines or whether the destination point is adjacent. 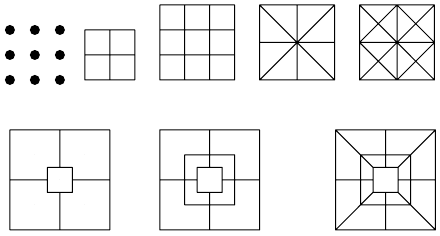 Alternative board layouts have been used over the centuries. One common pattern adds four extra diagonal lines to the board we considered here, see last board of the ﬁgure above. Pieces can be moved and mills made along these extra lines in the usual way.